Lanvall, Sabine Edelsbacher and Kurt Bednarsky formed the first line-up in the Austrian metal band Edenbridge in 1998. In 2000 came the release of their debut album 'Sunrise in Eden'. 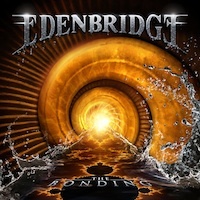 'The Bonding' is the eight studio production from the Austrian symphonic / progressive metal band. Sabine's vocals is the first thing that impress me in my first spin of 'The Bonding'. Extraordinary clear and pompous vocal performance throughout the entire album. She handles both the gentle and soft power ballads and the heavier and stiffer metal tracks. The opening track 'Mystic River' is a genre typical power track that I find interesting. A really nice ballad is 'Star-Crossed Dreamer', which has a different touch. The bold and progressive flamethrower track 'The Invisible Force' is perhaps the song that got stuck in my mind the fastest of the nine tracks. Sabine sings so easy and controlled through the song and it sounds absolutely perfect and balanced along with the heavy guitar riffs and hard drumbeats. Impressive and a very strong song. The melancholy and cautious track 'Into a Sea of Souls' is the special and unique song that I was looking when I listened to this album. Not my favorite song, but a unique and lovely song that I like more and more. It grows with each spin. 'Far out of Reach' is also a slower song with a fantasy theme. A really heavy prog metal song with some medieval music mix. Now I think to myself: Ahhhh typical 'Edenbridge'! It makes my grade rise up a bit. In the next track 'Shadows of My Memory' they are back in the classic power metal folder with a touch of grunt song initially. Little surprising to me actually. They manage to weave together very progressive progressions in the pompous power metal. Cool song that has razor sharp guitars by the way. Suddenly came a piano and only Sabine's clear voice in the introduction of the incredibly beautiful song 'Death is Not the End'. It turns into a really big power ballad with all the heavy instruments in the end of the tune. All music, lyrics, vocal melodies, production and orchestral arrangements are done by Lanvall.